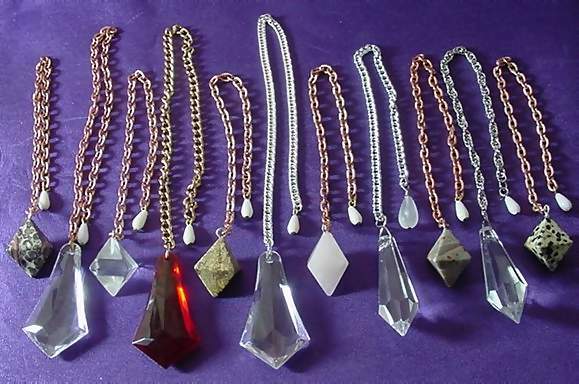 A pendulum is a divination tool commonly used for dowsing. It is by far the easiest divination tool to make at home. The basic design of a pendulum consists of a weight hanging freely on a chain or string. The weight can be almost anything such as special stones that hold spiritual power, a pendent or ring that one holds very dear or can be made of a completely mundane things such as a paperclip or metal washer. A pendulum can be used in a wide variety of ways such as a dowsing interment to locate underground source water, mineral and lost object or to receive answers to questions asked. Through use of a pendulum a skilled diviner can diagnosis illness , predict the weather, guess the lottery and horse race or to obtain answers to large range of questions. With the help of charts there is no limit to what a pendulum can do. Using a pendulum is rather simple. While giving the reading, the diviner should sit comfortably and hold the chain loosely between your first finger and thumb of our dominant hand. If using a chart for reading, it should be about an inch above the surface. Nothing other then your fingers on the chain should touch any part of the pendulum during the reading. Before a reading, it’s a good idea to do a sort of “calibration”. Ask the pendulum to show you a yes answer and then ask it to show you a no answer. Though asking questions that the answer is obviously a yes (I would ask “Is my name Katherine?”) and then a question with a no answer (such as “Am I the Batman?”), you can see just how the pendulum will react with different answers. People who have worked with their pendulum will know the movement of the instrument without having to ask these questions every time. Generally, most people consider it yes when for vertical movement, and no for horizontal movement. If you have a hard time reading the small swings of your pendulum, using a chart, as a guideline is a very good idea. A simple chart would just be a cross marked on it. While giving a reading, you want to keep the pendulum still. As the questions as asked, it will begin to swing with the answers. Always let it return to as still as you can make it before asking another question. It’s good to keep your elbow a sturdy table to aid in keeping your arm steady. Wording your questions correctly can help in discerning your answers. “Will it rain?” may come up with an unclear answer were “Will it rain in Pittsburgh tomorrow?” is a much better suited question. Skilled diviners can use the pendulum for more complex readings. Maps can be used to find lost items or locations of people (not recommended for trying to find Carman San Diego). Pendulums held over calendars can determine the date of a baby’s birth or other important dates. Talking boards (sort of like a ouiji board) can be used for more complex readings. There are Talking boards specifically used for pendulum working in specialty stores but I feel it’s better to make your own. Anything make with your own hands will hold a different and often better kind of energy. Pendulums can hold energy often times by the person who reads it but also by the other outside influences. It’s a good idea to keep it cleansed of any negative or stale energy. I carry mine in my pocket sometimes to keep it charged of my own energy and for sudden spontaneous readings. I find it to be soothing to keep it close and when I feel like it need to take it out I do. I consult it on small matters. Waling though the park, I ask it which path to take and it hasn’t failed me yet. I think the energy that gives me the answers comes from with in my subconscious. It’s a way of tapping into my own intuition to get answers where my own thoughts might get in the way. I’ve never used it for complex dowsing and would like to give it a shot to see how (and if) it really works first hand. I like to keep my pendulum on my altar to bless when I need it and to keep it clean of any negative energy. Any experiences you may have had or anything you may think I’ve missed, please leave a comment.